Insulating walls with plastic bottles stuffed with inorganic trash was pioneered in Guatemala by the organization Pura Vida. Instead of the common cinder-block walls used in Central America, “eco-bricks” are stacked in between chicken wire, and covered in cement. The bottles are used solely as insulation; the buildings are supported by professionally built, structurally sound frames. 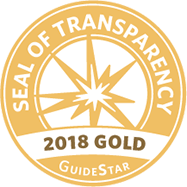 This method of construction is both eco-friendly and economical, and independent structural analysis has testified to the strength and safety of the buildings. 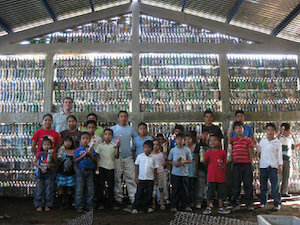 In our first project in Granados, Guatemala, in October 2009, over 5,000 plastic bottles were used to build two classrooms, containing 2053lbs of trash and using 9720lbs of cement. 297 children and youth currently attend the school, which serves a municipality of 13,860 people throughout 95.75 square miles. Since the completion of the Granados project, we have completed 9 more bottle schools, have 3more projects in progress, and more sites under evaluation for possible projects. We can build a bottle school for around $12,000.